Terrarium is an experimental film shot in June, 2016, over two days at Waskwei River, Pasquia Hills, Saskatchewan. To read the full story, see Come Hell or High Water. This was our first film to be shot entirely while on a backpacking trip in a remote area. To complicate the shoot, we were plagued by mosquitoes and over 24 hours of rain. The instrumental soundtrack features audio samples recorded over the course of the trip. Film by Ken Wilson with new soundtrack by Andy Goodson. Screened at Open Aperture: Film & Sound, June 8, 2017, Regina, Saskatchewan. Autobiology, by filmmaker Ken Wilson, is an abstract, personal film about a search for identity and meaning, and the relationship between humans and other life forms. The film was made in 2012 and was screened with the new soundtrack at the Open Aperture: Film & Sound event, a collaboration between Saskatchewan Film Pool Cooperative and Holophon Audio Arts. The soundtrack is composed entirely of sampled field recordings from multiple locations over the course of several weeks. Some of these recordings include crowds and street musicians at the Cathedral Village Arts Festival, a windy morning on a farm outside Melville, SK, and birdsongs heard during a camping trip at the Assinioboine River (See also: Cracked Canoe on the Assiniboine). The recordings were sampled and arranged to form a soundtrack that transforms throughout the film's eight minute runtime. Distortion, repetition and pitch-shifting were used to blend the various sounds, both natural and human-made. Directed by Mitch Doll, Andy Goodson and Sean Hootz. Soundtrack by Goodson. Little Boggy Creep is a short film shot at Duck Mountain Provincial Park for the 2017 One Take Super 8 Event, inspired by Adventures with Bill segments on The Red Green Show. Like our last Super 8 film, For the Frogs, it is shot on one continuous reel with no edits or post production. The film stars Matt Goodson as 'Le Ghoul' and David Litzenberger as 'Feral Bachelor'. The musical soundtrack is written and produced by Andy Goodson, and is loosely based on the song Ripple by The Grateful Dead. The blood used in the film is a mixture of powdered sugar, corn starch and red food colouring. The result is a watery and off-coloured mess, so a cup of yellow mustard was added to thicken the mixture and warm the colour. By the final scene, several flies had drowned in the blood, which Matt uses to deliver a naturally uncomfortable performance. Filmed by Mitch Doll, Andy Goodson and Sean Hootz. Soundtrack by Goodson. 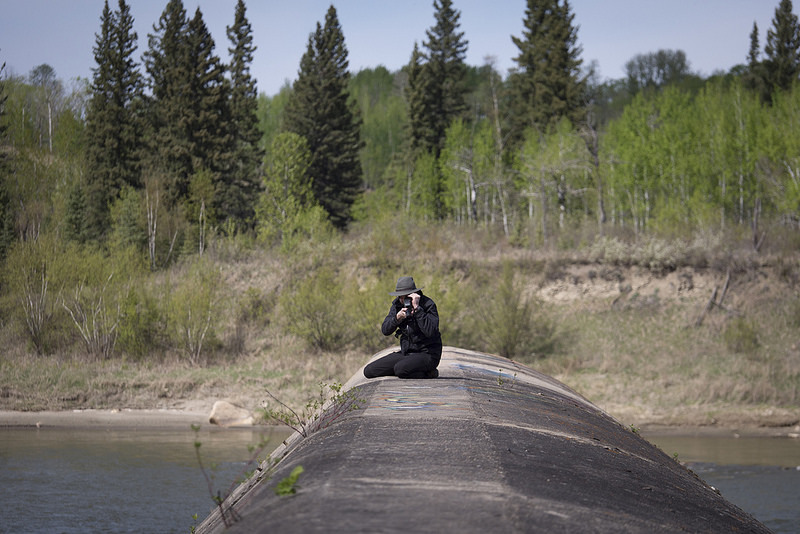 For the Frogs is a three-minute experimental film set in the abandoned La Colle Falls Hydroelectric Dam east of Prince Albert, Saskatchewan. It was shot black-and-white on a single Super 8 film cartridge without review, cuts or any post-production as per the guidelines of the One Take Super 8 Event. The scratches and distortion are caused by a botched attempt at the double exposure technique, complicated by the Super 8 film format. After our first day's shoot at La Colle Falls, Mitch tried re-spooling the film cartridge by touch alone, using a light-proof bag fireside while we camped overnight in Fort à la Corne Provincial Forest. The film did not take properly and the following day's shoot was not recorded. Most of the film remained underexposed and moderately damaged. Our intention was to travel somewhere new and come up with a script on location. 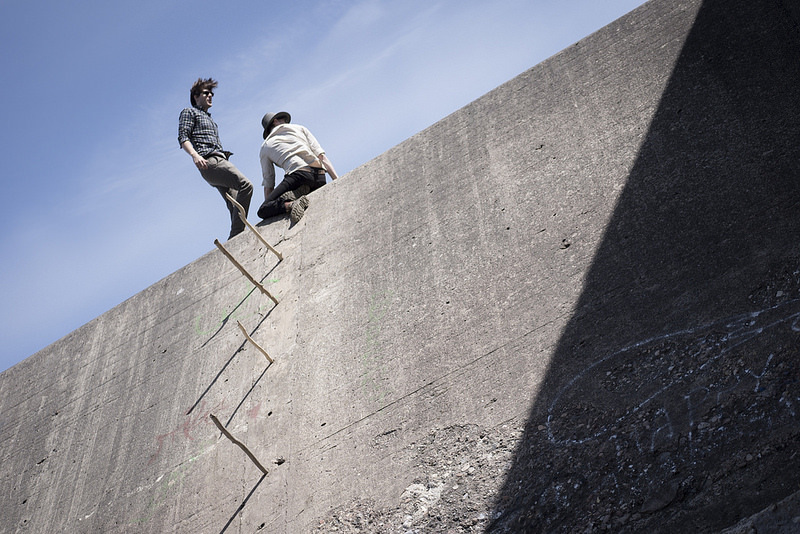 The dam site provided us with interesting shapes and light to play with, and audio samples which later made their way into the soundtrack. Since the One Take Super 8 Event restricts filmmakers from viewing their work beforehand, we noted the time of each transition to synchronize the audio.